My wife bought me a Miller TIG welder as an anniversary present. I love her very much. This is what I did yesterday. In total, it was about 6 hours of work. This is my first project in stainless steel and I was a bit nervous after having read of the problems others have had. I'm releived to say that it wasn't as bad as I expected. I did shatter two carbide inserts threading the external threads. However, the trick seems to be to take very light cuts. The brazed in tubes are new to me also. The braze material is a Silver with Nickel alloy from McMaster. Torch brazing them wasn't much harder than pipe soldering although you do have to be carefull about burning the flux. Some one asked how fast the valves move with these actuators. I did a test this morning with a 6 cell NiMH battery. With the 750 psi line pressure, the frame count was 9.5 frames, or 0.317 seconds/90 degrees. A blog isn't really a great archival medium so I've created a new website, www.rocketmoonlighting.com. I can still use the blog for, well ... blogging ... but information can be organized by project on the website which may make it more useful. I've already populated a few project pages. Some of the pictures you've seen before, some not. Among the new stuff, you'll find some drawings of the restartable hybrid motor and the new bipropllant motor. For personal reasons, I won't be bending metal or testing much over the next couple of months. I will however have time to deskwork like posting to the blog. I was wondering if anyone had any requests. Design? Drawings? Analyses? Data? 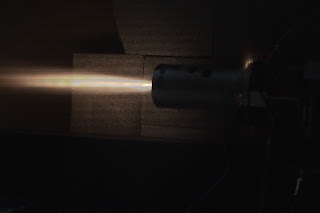 The video from this previous post was taken during testing of a bi-propellant engine I've been working on. I've been testing various chamber lengths trying to get good combustion. Here's a picture from a later test. You can see the Swissflow flow meter bottom left. I've been using the SF800 from Swissflow lately to measure propane flow rate. It works well once you realize that the red wire is ground not positive supply. It uses BSP threads which are slightly inconvenient as well. The version I'm using has a fiber reinforced plastic housing and is rated for working pressures up to 230 psi. They have a metal bodied version rated up to 3600 psi that I plan to use with N2O. Instead of using a steel rotor and a hall effect sensor, this meter has a plastic rotor with an IR emitter/collector pair. It outputs a nice square wave pulse with frequency proportional to flow rate. My DAQ board (from Measurement Computing) has a counter input which can be configured to measure frequency so interfacing to the existing DAQ software is quite simple. This is a picture of hydrotesting I did on a 6" 316 Stainless steel float from McMaster-Carr (2762K49). It failed at 2150 psi. Interestingly, the failure was a tiny pinhole that opened right at the weld termination. My grease gun was not able to pump enough water fast enough to get the pressure higher higher than 2150 once the hole opened up. I proof tested a second of these floats to 1900 psi without failure. And 3 more were tested to 1500 psi. I have developed a direct drive version of the valve I've been using. It was used in my last testing which was described in the previous post. The packaging comes out quite nicely. 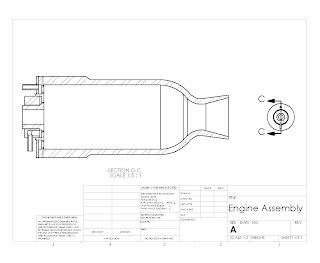 They have several advantages to the linkage actuated version - this will be my go forward design. Along those lines, I have been wondering if there are people out there that might like to buy a pre-made valve like this one. It was actually more of a pain to build than I thought it would be and personally, I prefer to spend my time building rockets rather than various peripheral devices. If you're interested in buying a valve like this, drop me an email. Long time, no post. I wish I could say the delay was due to my making lots of progress and not having time. The truth is much closer to not having much to share. I was able to get out and test some modifications this weekend. The good news is that the urethane o-rings seem to be working. I did a long term pressure test with N2O to see if they would remain sealed for several days. Also, after the testing this weekend they showed no signs of damage. The main point of this weekend's testing was to test a new configuration with the propane/spark ignition with the goal of eliminating the initial pressure spikes. The new configuration seems to have reduced the tendency towards hard-starts. Unfortunately, the ignition sequence which was quite reliable before is no longer. I spent quite a bit of time just getting it to light at all and stopped testing without arriving at a reliably repeatable sequence. Recently, I've been working on integrating my test setup onto a trailer so that I'm not constrained by working in the garage. I haven't had any complaints but I felt that doing 60-90 second burns might be pushing my luck in the future. Last night was the first attempt at using the trailer to test and I was very pleased with how it all turned out. It took almost exactly 1 hour from the time I arrived home from work to the first test. During that time, we loaded the van, drove to the test location (about 10 minutes), and setup the electronics on-site. There were no issues with the test stand and everything worked correctly the first time. The light sequence is very reliable. I actually had two lights that are not shown in the video - for the day, the motor was 5 for 5 on light attempts. Unfortunately, there is still a fairly high pressure spike at ignition that was triggering a redline on chamber pressure. I had lowered the chamber pressure redline to just a tiny margin above the design maximum - the startup spike is around ~25% higher than that. On the first two tests of the day (not shown in the video), the software redlined at engine start and aborted the test. For the the first two tests in the video, I raised the redline limit and the motor started fine and executed a scripted throttle profile. On the last test, I knew that there was probably a damaged seal in the throttle valve but I decided to initiate a test anyway (the venting between the second and third light is a result of the damaged seal). The end result of that test is obvious - another blown gasket. I'm not sure yet what the exact cause of the blowout was - the data did not show a pressure spike that was larger than any of the previous tests that day. I have not yet reviewed the data in detail nor have I disassembled the motor to inspect it. 2) Blown gaskets at start up - I think solving 1) should help solve this one. Maybe a new gasket material is in order. PS - Damien gets 10 points. The propane bottle can be seen in the video at the center of the screen. However, I would not call it a "torch". So, I've been remiss at posting. Its going to be a few more days before I post "Ignition Part 2". Rather than offer excuses, I'll offer a hint. The picture is a detail shot of the injector side of the motor where all the magic happens. 10 points to anyone who can guess how it all works. PS - the tank at the bottom of the picture wrapped in electrical tape is a red herring. 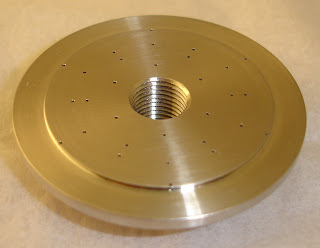 I ran across a post on LLC competitor SpeedUp's website about vibrations in their test stand. The post reminded me of some similar tests I did to measure vibrations in thrust measurements. As you might be able to tell from the picture in this post , I'm using a beam load cell to measure thrust. It has the advantages of being relatively easy to mount and requiring only one load cell. It has the disadvantage of turning the engine into a vibrating, cantilevered beam supported by the load cell. Fortunately, my data sample rate was 10kHz, so I was able to spot the low frequency ringing by comparing the thrust and chamber pressure data. In order to determine which frequencies were caused by the test stand and which were "real", I did a hammer test. My test stand is mounted on a steel I-beam, so I turned on the DAQ system and hit the beam with a hammer. The next two charts show the raw thrust data and a FFT of thrust data. The FFT shows vibrations at 31, 33, and 85 Hz, so I can use a digital filter to remove that frequency content from my test data. I use and recommend Sigview to do plots, FFTs, and filtering. When I started this project, I chose nitrous oxide and HTPB for propellants. 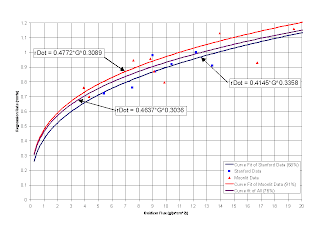 However, at the time there was no published data on regression rates for that propellant combination. So I started out with a small lab motor that is shown in the previous posts. It was a simple design, similar to motors used in high power rocketry with the exception that the case was 4130 steel instead of aluminum. That motor turned out to be a good way to do many more things than simply collect regression data. Finding vendors, setting up data acquisition, and learning plumbing best practices are all non-trivial tasks. In keeping with the test a little, build a little philosophy, I find it much easier to incrementally add features as you go. Not worrying about all the features a motor (or any system for that matter) needs to have will often generate more progress than a "single step to solution". Or as my brother says, sometimes you need to just go build something even if you're not sure what it is. In the intermediate time between when I started and now, a group at Stanford has started publishing data for nitrous oxide hybrid motors. You can read the first page of their papers here and here. Fortunately, their data and mine compares reasonably well as you can see in the chart. Once I had reasonable regression data and a working test stand it was time to start building a flight worthy motor. However, before you design a motor you have to choose a vehicle architecture. A VTVL vehicle has a much different motor than a sounding rocket. I'll talk a little about motor applications in a future post. First, "Moonlighting" is a bit of a misnomer. moon·light unˌlaɪt/ Pronunciation Key - Show Spelled Pronunciation[moon-lahyt] noun, adjective, verb, -light·ed, -light·ing. 5. to work at an additional job after one's regular, full-time employment, as at night. You have to get paid for it to be moonlighting. I'm not, so it's not moonlighting. I've been working on building hybrid rocket motors in my garage for about two years. Having made some small measure of progress and lacking any eminent prospects for starting a rocket business, I thought I would share some of my lessons with the community. I hope that what I can share may be of some small help to others. To start, here is a picture of my first motor.